Candidate filing for the 2019 Primary Election is available from January 9 until Noon on February 8, 2019. Candidates should file at the Porter County Clerk's office located in the Porter County Courthouse at 16 Lincolnway, Suite 209 in Valparaiso. The Clerk's office is open Monday through Friday from 8:30 AM to 4:30 PM. Construction at the Courthouse is ongoing, so please be aware that parking may be difficult during high traffic times. Please enter through the NORTH entrance to the Courthouse. Please note that cell phones are not permitted in the Courthouse and individuals are subject to security screening. 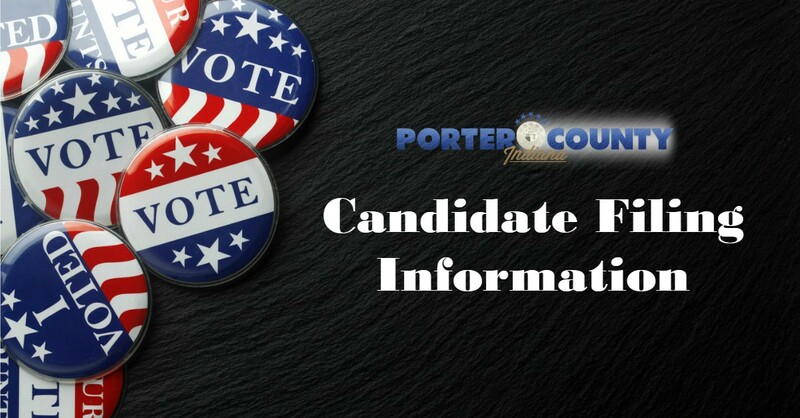 The Porter County Clerk's office and the Indiana Secretary of State Election Division have provided important informational resources for candidates, and it is highly recommended that you download and read these materials. Just click on the links below. If you have any questions regarding filing, just CLICK HERE to email the Clerk's office. All Major Political Party Candidates are required to complete and file a Declaration of Candidacy (CAN-42) and a Statement of Economic Interests (CAN-12). These forms are available by clicking on the applicable links below. Please note that some forms MUST be signed in the presence of a Notary Public. If needed, a Notary Public will be available at the Clerk's office Tuesday through Friday (except for Tuesday, January 15)from 8:30 AM until Noon and 1:00 to 4:30 PM. All Minor Party and Independent Candidates are required to complete and file three forms. These forms can be downloaded by clicking on the applicable links below. The Petition of Nomination (CAN-44) can be submitted for certification beginning on January 9 but no later than Noon on July 1, 2019. The Statement of Economic Interests (CAN-12) and the Written Consent to Become a Candidate (CAN-45), accompanied by the certified Petition of Nomination must be filed no later than Noon on July 15, 2019. Please note that some forms MUST be signed in the presence of a Notary Public. If needed, A Notary Public will be available at the Clerk's office Tuesday through Friday (except for Tuesday, January 15) from 8:30 AM until Noon and 1:00 to 4:30 PM. Click on the appropriate link below to view candidate filings for each municipality.